The PL1 features two SansAmp channels as well as other custom appointments. Rammstein guitarist Paul Landers has collaborated with Tech 21 on the new PL1 Signature Fly Rig. 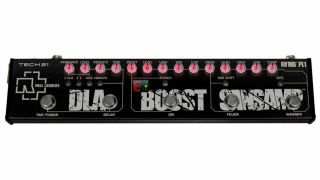 The unit boasts 2 SansAmp channels—Feuer (dirty) and Wasser (clean)—and features include delay and custom-designed Vibrato effect with tap tempo control, Ambiance with choice of size and two modes of Boost. As for what makes the PL1 so unique, Landers continued: “There is a different engine inside it; in fact, there are two independent engines in there: one for the Feuer [dirty] sound and the other for the Wasser [clean] sound. “The main [Feuer] sound is based on the SansAmp GT2, which I’ve used for a long time. I have this specific setting that I dial in and we wanted to build the same sound inside the PL1 so that I could use it for my main tone. Other PL1 features include a chromatic tuner, headphone capability, XLR output for direct recording and going direct to a P.A., illuminated controls, studio-grade metal footswitches and jacks and an included universal power supply. The unit is enclosed in a rugged, all-metal housing and weighs in at just over 20 oz. For more information on the PL1 Signature Fly Rig, head over to Tech21nyc.com.